Displayed: USMC award period and Army non-award period member. All Five Service Branch award and non-award period Air Force, Army, Coast Guard, Marine and Navy are Applicable. An unaltered photocopy of your Report of Separation listing your MUC authority or the name of your MUC unit. If your MUC authority or MUC unit is not listed on your Report of Separation you must provide a copy of your Report of Separation -AND- a copy of any military-issued document displaying your name and your unit or vessel name. Click for Army and Air Force, Navy and Marine Corps, Coast Guard. The Meritorious Unit Commendation was originally established by War Department Circular 345 on August 23, 1944, as the Meritorious Service Unit Plaque. Change 12 to Army Regulation 672-5-1 dated April 6, 1966, changed this award from a patch to a scarlet ribbon worn inside a gold frame. The Meritorious Services Unit Plaque took effect on January 1, 1944 (the Meritorious Unit Commendation ribbon was made retroactive to January 1, 1944). The Meritorious Unit Commendation is awarded to units for exceptionally meritorious conduct in performance of outstanding services for at least six continuous months during a period of military operations against an armed enemy on or after January 1, 1944. Although service in a combat zone is not required, the unit's accomplishments must be directly related to the larger combat effort. The unit must display such outstanding devotion and superior performance of exceptionally difficult tasks as to set it apart from and above other units with similar missions. The degree of achievement required is the same as that which would warrant award of the Legion of Merit to an individual. Only in rare cases will a unit larger than a battalion qualify for this award. For services performed during World War II, this award was limited to service units and was restricted to services performed between January 1, 1944 and September 15, 1946. Members of units that received the Plaque were entitled to wear on their right sleeve a two inch square of olive drab cloth on which appeared a golden yellow laurel wreath one and five-eighths inches in diameter. Effective March 1, 1961 the Meritorious Unit Commendation was authorized for units and/or detachments of the Armed Forces for exceptionally meritorious conduct in performance of outstanding services for at least six months in support of military operations. Change 12 to Army Regulation 672-5-1 dated April 6, 1966, replaced the patch with a scarlet ribbon worn inside a gold frame. The Meritorious Unit Commendation is worn after the Valorous Unit Award and before the Superior Unit Award. Additional awards of the Meritorious Unit Commendation are denoted by oak leaf clusters. 1. Description: The Meritorious Unit Commendation emblem worn to represent award of the Meritorious Unit Commendation is 1 7/16 inches wide and 9/16 inch in height. The emblem consists of a 1/16 inch wide Gold frame with laurel leaves which encloses a Scarlet 67111 ribbon. The previously authorized emblem was a Gold color embroidered laurel wreath, 1 5/8 inches in diameter on a 2 inches square of Olive Drab cloth. 2. 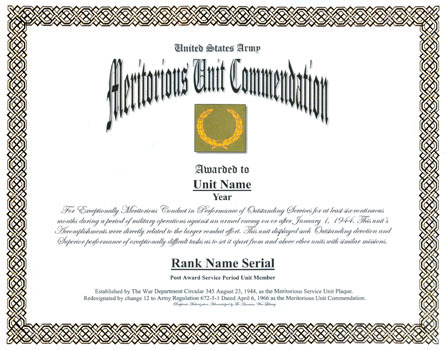 Criteria: The Meritorious Unit Commendation is awarded to units for exceptionally meritorious conduct in performance of outstanding services for at least six continuous months during the period of military operations against an armed enemy occurring on or after 1 January 1944. Service in a combat zone is not required, but must be directly related to the combat effort. CONUS based units are excluded from this award as are other units outside the area of operation. The unit must display such outstanding devotion and superior performance of exceptionally difficult tasks as to set it apart and above other units with similar missions. The degree of achievement required is the same as that which would warrant award of the Legion of Merit to an individual. Only in rare cases will a unit larger than a battalion qualify for award of this decoration. For services performed during World War II, awards will be made only to service units and only for services performed between 1 January 1944 and 15 September 1946. Effective 1 March 1961, the Meritorious Unit Commendation was authorized for units and/or detachments of the Armed Forces of the United States for exceptionally meritorious conduct in performance of outstanding services for at least six continuous months in support of military operations. Such service is interpreted to relate to combat service support type activities and not to the type of activities performed by senior headquarters, combat, or combat support units. 3. Component: The current components of the Meritorious Unit Commendation are the emblems awarded to members of the unit and the streamer for display on the unit flag/guidon. 4. Background: a. The Meritorious Service Unit Plaque was established by War Department Circular No. 345, dated 23 August 1944. The circular provided that military personnel assigned or attached to an organization were entitled to wear the Meritorious Service Unit Insignia on the outside half of the right sleeve of the service coat and shirt, four inches above the end of the sleeve. Additional awards were to be indicated by a gold star to be placed on the plaque. War Department Circular No. 54, 1946, provided that additional awards would be indicated by placing a golden numeral inside the wreath. b. DF, D/PA, Subject: Proposed AR 260-15, Unit Awards, dated 12 December 1946, stated "In order to enhance the prestige of an award to a meritorious service unit, the present Meritorious Service Unit Plaque has been eliminated, and in lieu thereof a Meritorious Service Unit Commendation has been established on a plane comparable to the Navy Unit Commendation and may be awarded to any type of unit for meritorious service during military operations which, if performed by an individual would warrant the award of a Legion of Merit. The Coast Guard Meritorious Unit Commendation was established on November 13, 1973, by the Commandant of the Coast Guard, Admiral Chester R. Bender. The Coast Guard Meritorious Unit Commendation has been in effect since November 13, 1973. The Coast Guard Meritorious Unit Commendation may be awarded by the Commandant (or designated subordinate awarding authorities) to any unit of the Coast Guard for valorous or meritorious achievement or service in support of Coast Guard operations not involving combat. The performance of duty must render the unit outstanding when compared to other units performing similar service but not of such a nature to merit award of the Coast Guard Unit Commendation. This award may be conferred by the Commandant upon units of other branches of the Armed Forces of the United States, provided they meet the standards established for Coast Guard units. To justify this award, the service performed must be comparable to that which would merit the award of at least the Coast Guard Achievement Medal to an individual. The ribbon to the Coast Guard Meritorious Unit Commendation is worn after the Coast Guard Unit Commendation ribbon and before the ribbon to the Meritorious Team Commendation. Additional awards are denoted by gold stars. The Operational Distinguishing Device, a silver O, may be authorized. Authorized by the Commandant of the Coast Guard on November 13, 1973, it is awarded by the Commandant of the Coast Guard to any unit of the Coast Guard or Coast Guard Reserve which has distinguished itself by valorous or meritorious service in support of U.S. Coast Guard operations. The Operational Distinguishing Device (silver letter "O") may be worn on this ribbon when authorized. The Meritorious Unit Commendation was established on July 17, 1967, by Secretary of the Navy John T. McNaughton. The Meritorious Unit Commendation has been in effect since July 17, 1967. 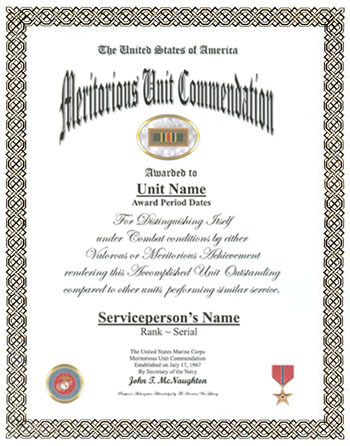 The Meritorious Unit Commendation may be awarded by the Secretary of the Navy to any unit of the Navy or Marine Corps that distinguishes itself under combat or noncombat conditions by either valorous or meritorious achievement which renders that unit outstanding compared to other units performing similar service, but not sufficient to justify the award of the Navy Unit Commendation. It may also be awarded to units of the other branches of the Armed Forces of the United States as well as to units of foreign nations serving with U.S. Forces, provided they meet the same standards established for Navy and Marine Corps units. To justify this award, the unit must perform service of a character comparable to that which would justify the award of the Bronze Star Medal, or achievement of like caliber in a noncombat situation, to an individual. The Navy Meritorious Unit Commendation was established by order of the Secretary of the Navy on July 17, 1967. 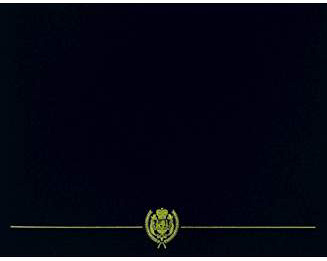 It is awarded in the name of the Secretary of the Navy to units of both the U.S. Navy and United States Marines. To justify this award, the unit must have performed service of a character comparable to that which would merit the award of a Bronze Star Medal, or achievement of like caliber in a non-combat situation, to an individual. The Meritorious Unit Commendation is worn after the Unit Commendation ribbon and before the Navy "E" Ribbon. Additional awards of the Meritorious Unit Commendation are denoted by bronze stars three-sixteenths of an inch in diameter. Authorized by SECNAVNOTE 1650, on July 17, 1967, and awarded by the Secretary to any unit of the US Navy or Marine Corps which distinguished itself by either valorous or meritorious achievement considered outstanding when compared to other units performing similar service, but not sufficient to justify award of the Navy Unit Commendation. Awarded for combat or non-combat services.